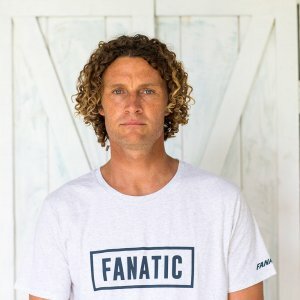 Hi Sky, Fanatic just launched their 2019 Foil collection for Prone Surfing, SUP and also Windsurfing. Please tell us about the range and what’s been improved. Firstly, the range doesn’t have much to do with the previous foils we offered. The wings got completely redesigned for higher efficiency, increased range, improved control and really smooth and predictable turning. Secondly, we largely stepped up our game in terms of all parts. Every little detail has been analyzed and improved by a new task force in cooperation between Fanatic and Duotone Kiteboarding. A lot of the parts between the different disciplines have the same or very similar functions and the goal was to develop a high-end product with outstanding quality that’s still affordable. Most of these changes are not visible at first glance, but once you take off with one of the new foils you’ll feel the difference immediately. The Aero Surf/SUP range consists of 3 different size front wings, two different back wings, a short and a long fuselage and one 75cm mast for all possible combinations, as the wings and fuselages are all interchangeable. We’ve made 4 main combos which we’re offering as packages, but you can always upgrade with single pieces of course. In the Flow Windsurfing range we have two different front wings, two masts, one fuselage and one back wing. These make two combos, one for light wind/entry, one for performance free-foiling. That sounds interesting! Can you give us details on the technical side? I mean you use Aluminum and Carbon Composite – that’s nothing new…? The materials themselves are just one piece of the puzzle, but even here you can have massive differences. People tend to think aluminum is aluminum and carbon is carbon, but in reality there are different grades of both materials. We use a very high-grade aluminum mast which is made in Germany. It’s about 30% stiffer compared to other aluminum masts and it’s not easy to beat that rigidity with carbon. But even more important is how the different parts are connected. The connections are usually the weak spots and the engineering team took enormous focus on making the connections bulletproof. Stainless steel heli coil threads make sure you can load the M8 screws with 1.2 tonnes each without any corrosion issues. The glued and screwed connection of mast and base plate essentially creates a one piece construction at the most crucial connection point. The mast fits nicely into a pocket in the fuselage for the best force transmission and the wing itself sits on a large bearing surface which spreads the load nicely. Also that system will not wear out and never gets stuck like a lot of pocket connections offered by other brands which you’d often need a rubber hammer to disconnect. The layup of the wings is a mix of unidirectional and 30° oriented carbon fibers for highly improved torsional stiffness. We took the long road with different suppliers for the different pieces, but we ended up with good solutions for every single part and a high quality product which is still affordable. Can you change wings also from Surf to Windsurf to Kite? For Prone Surf Foiling, SUP Foiling and Windsurf Foiling it’s key to have something rigid under your feet. Some of the Surf wings are huge and create a lot of lift and power. Especially when pumping you don’t want to loose energy into a bending mast, a twisting fuselage or wobbly connections. In Windsurfing you bring a lot of force onto the mast due to the outside stance – combined with generally higher speeds these forces also transfer through the fuselage into the wings. That’s the reason we have a stronger fuselage at Fanatic for both WS and SURF than our friends of Duotone Kiteboarding. They don’t need to control the same forces, so are able to go for a sleeker, lighter and faster version of the fuselage. Windsurfing Wings are of much higher aspect compared to our Surf Wings and that’s the reason we had to opt for a smaller mounting surface. Box positions is another factor, as the Windsurfing stance plus the extra balance point of the rig is very different to the Surf or SUP stance, so the mast is mounted further back on the fuselage on the Windsurf Foils in order to have the right balance under the board. In short: No – the wings between Surf, Windsurf and Kite are not interchangeable as we’d end up with a compromise and not the ideal solution for each discipline. Within each discipline everything is interchangeable though. Makes sense and sounds like the way to go! Can you give us an insight of how the new foils ride? In Surf and SUP Foiling I can compare directly from our previous Aero 1500 (Boomerang shape) to the new wings. The previous wing is quite fast, as it has a thinner profile, so it handles faster/bigger waves really well. At lower speeds we found it could be improved, so we designed the new wings with a thicker and more low-end oriented profile. Where the old wing kind of drops out of the sky at a certain speed, the new wings just keep flying for much longer and you can actually pump them back up to speed. The turning is much more predictable on the new wings, which helps a lot to adjust your lines the way you want and to have more focus on the wave and not on your foil. Things just get so much easier on our new foils, it’s unbelievable how fast people suddenly learn foiling. I wish I’d had these foils when I was starting! For Windsurfing the new Flow Range is a whole new level compared to the previous Flow H9. The entire Foil is so much more rigid, more controlled and easier to ride, but at the same time offers so much more performance. Everyone who tried these foils during our recent dealer meeting on Tenerife was really impressed! Looks like you really stepped it up – but that was about time, as other brands have developed a much larger foil program over the last years…?! Yes we must admit we were not amongst the fastest with our foil program. Even more so we wanted to come with a fully developed and highly efficient range now to set a benchmark. At the same time we want to keep things simple and easy to understand, without too much confusion, so our range is still lean, but easy to upgrade and tune to everyone’s needs. We want to make foiling fun, easy and accessible for a large number of people. We’ve seen pictures and short videos of guys riding your Fanatic Sky Surf and SUP Foil boards and some kind of kite-looking wing in their hand. What’s that about? Yes, that thing is amazing! It brings Surf Foiling into the ocean swell and even flat water without paddling! Initially we tested these wings for Foil SUP downwinders on Maui to replace the paddle. Ken Winner took the idea further and made wing after wing until we had something which was stable, light and easy. The biggest game changer was when we realized we were able to go upwind. Just recently we got some of our Windsurf and Kite teamriders from Fanatic / Duotone to try these wings. They were so hooked they didn’t even think about windsurfing or kiting that day. There will be more info on these wings soon, but one thing is to say is that in combination with the new Flow Foils, especially the 2000front wing and long fuselage combo, they work unreal and open up Surf Foiling to areas where that side of the sport doesn’t exist yet! The post BEHIND THE BRAND – SKY SOLBACH TALKS FOIL appeared first on Fanatic.